The Avengers is a 1960s British espionage series produced by the Associated British Corporation (ABC Television) which first aired in 1961 lasting for 161 episodes before ending 1969. 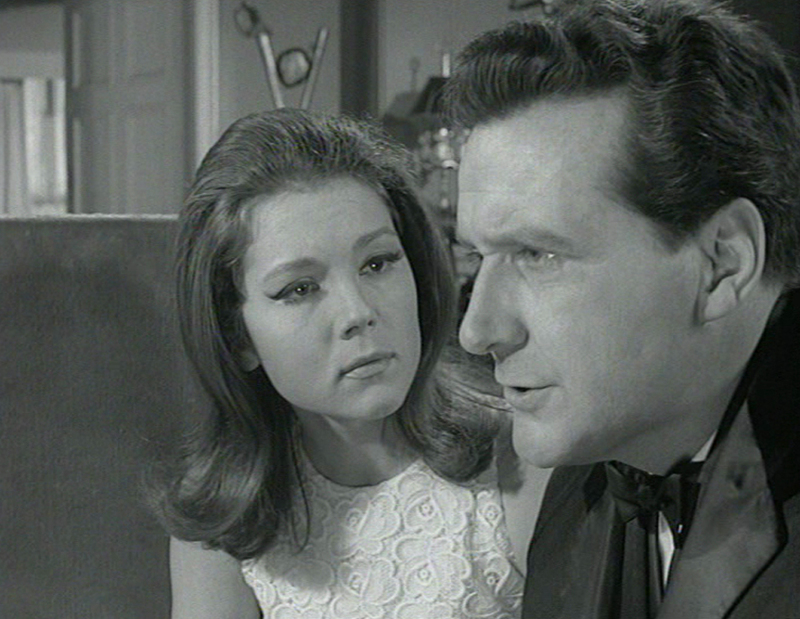 The series initially starred Ian Hendry as Dr. David Keel but following his departure at the end of series one John Steed, portrayed by Patrick Macnee, became the main character and was partnered by several glamorous assistants including Honor Blackman as Cathy Gale who starred in series two and three before leaving to pursue a career in feature films and starring in the 1964 James Bond picture Goldfinger. 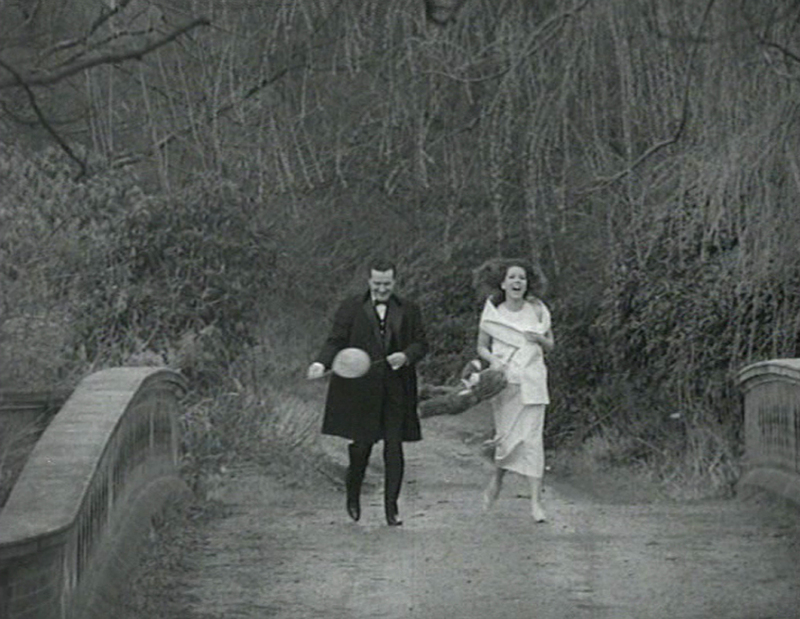 A huge change in the fortune of the series came in 1965 when it was sold to the American Broadcasting Company for a reported $2,000,000 which was a huge sum at the time, it was this deal with ABC which was instrumental in the series being filmed exclusively on 35mm film and soon after in colour. 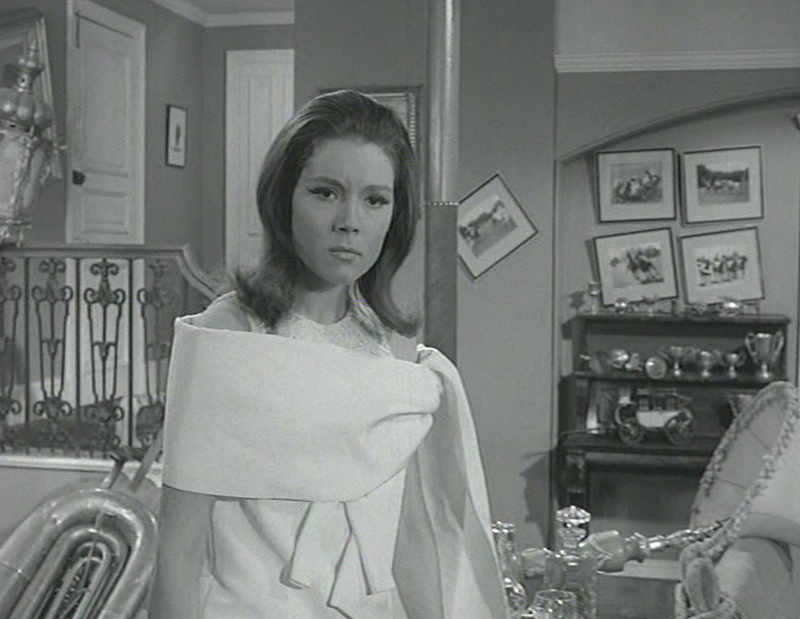 By this time Elizabeth Shepherd had been cast as Emma Peel for series four although she was deemed unsuitable for the role and was replaced with little known actress Diana Rigg, it is arguably this casting combination for which the series is best remembered today and The Avengers remains a memorable and iconic favourite of 1960s television. The character name has been reported as being derived from the phrase 'man appeal' shortened to 'm appeal', a take on the phonetic spelling of Emma Peel and a key characteristic of the new heroine. Steed's new partner was a highly educated master of martial arts, attractive, sexually confident and flirtatious she was desired by men and served as a role model to women in an era where empowered female leads were not commonplace. 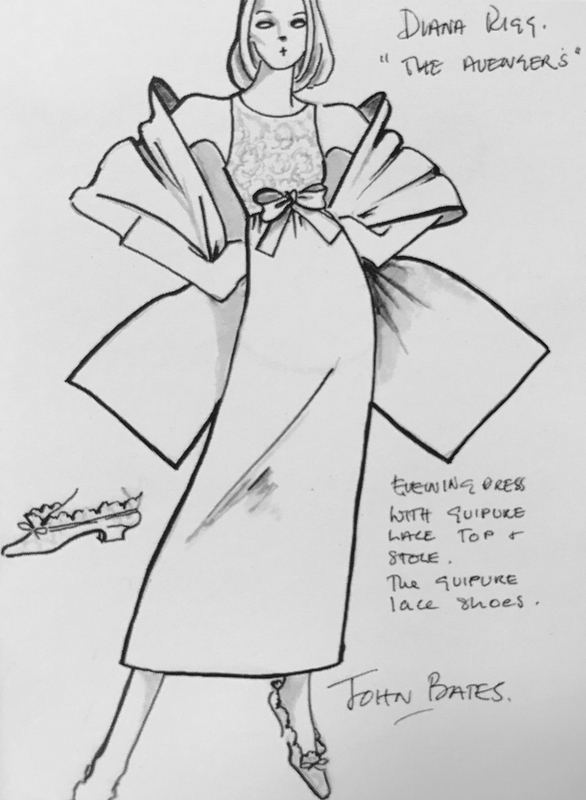 A key element to the new character was the stylish contemporary outfits worn by her throughout the series, fashion editor Anne Trehearne was hired as a consultant and approached designer John Bates who became responsible for much of the memorable wardrobe worn by Rigg in series four. 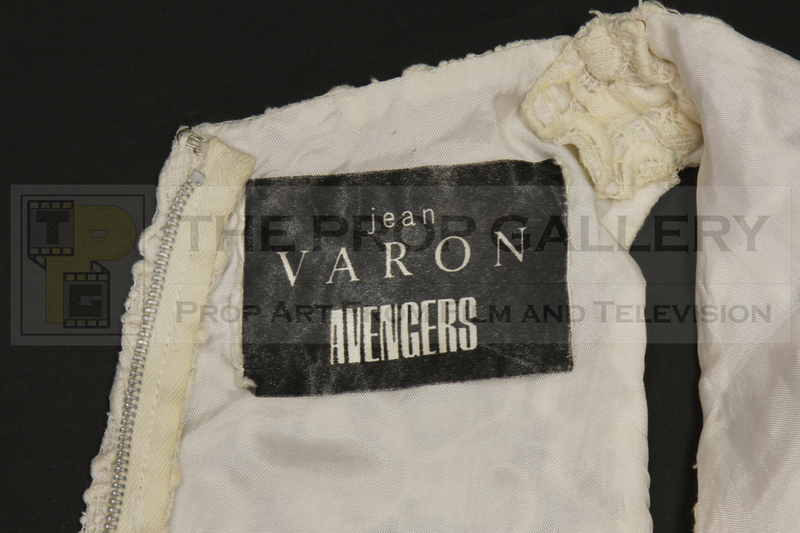 Since 1959 Bates had designed under the alias Jean Varon and it was this name which would become synonymous with the series, Bates' designs coupled with the success of The Avengers on both sides of the Atlantic propelled him in to the mainstream and he licensed them for retail sale, marketed as The Jean Varon Avengers Collection his designs garnered extensive media coverage appearing in major newspapers and magazines including Vogue where they were worn by noted English model Jean Shrimpton. 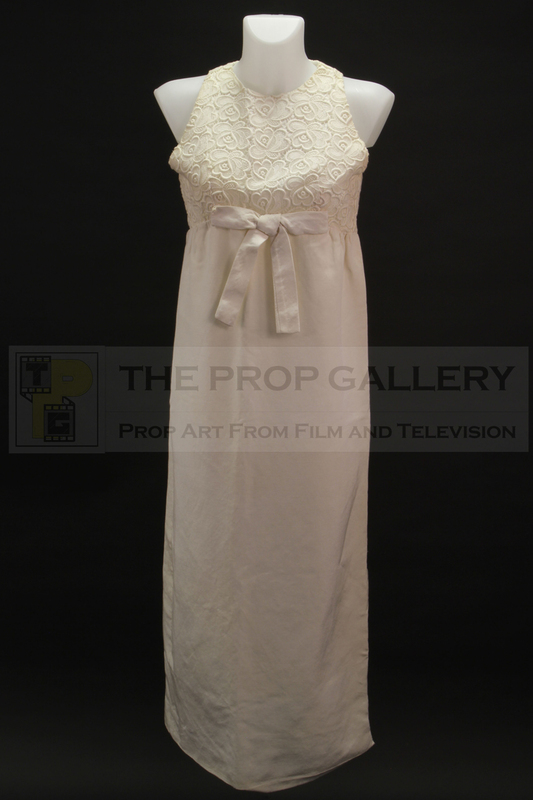 This dress was designed by John Bates and worn on screen by Diana Rigg as Emma Peel in the series four episode Honey for the Prince. 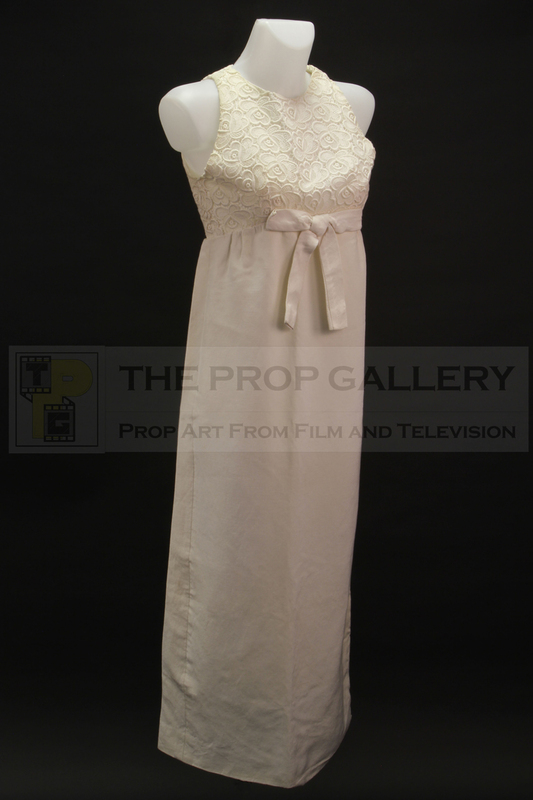 This ivory coloured sleeveless evening gown with matching stole can be seen worn by Rigg from the beginning of the episode as she returns from the party with Steed, the floral guipure lace bust accessorised with a large bow above the waist were both features of the designers earlier work with the latter becoming a signature feature on many later creations. 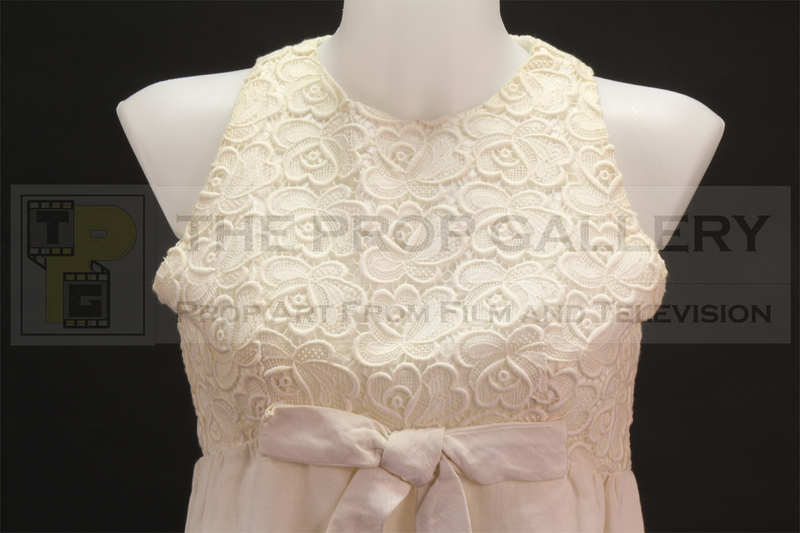 To the interior the gown retains its original Jean Varon label which is printed with the series logo and the unique costume can be conclusively matched to the one worn on screen by the intricate floral detail. 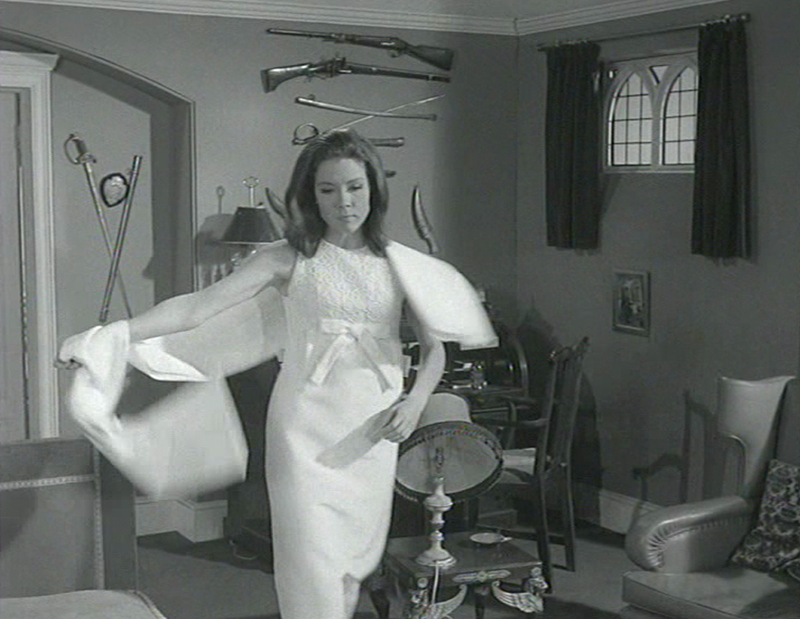 The series six opener The Forget-Me-Knot marked the final appearance of Diana Rigg as Emma Peel and the series was subsequently cancelled, Rigg would follow in the footsteps of former series actress Honor Blackman going on to star in the 1969 James Bond picture On Her Majesty's Secret Service becoming the only on screen wife of 007. 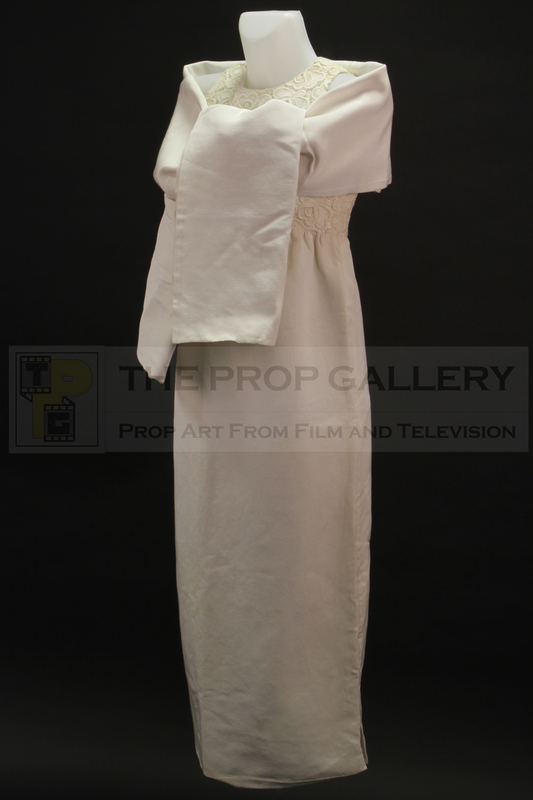 As his popularity grew Diana Rigg modelled for designer John Bates in to the 1970s, he remains an important name in British fashion and one who is widely credited with the popularisation and shortening of the miniskirt with much of his success attributable to his work on The Avengers. 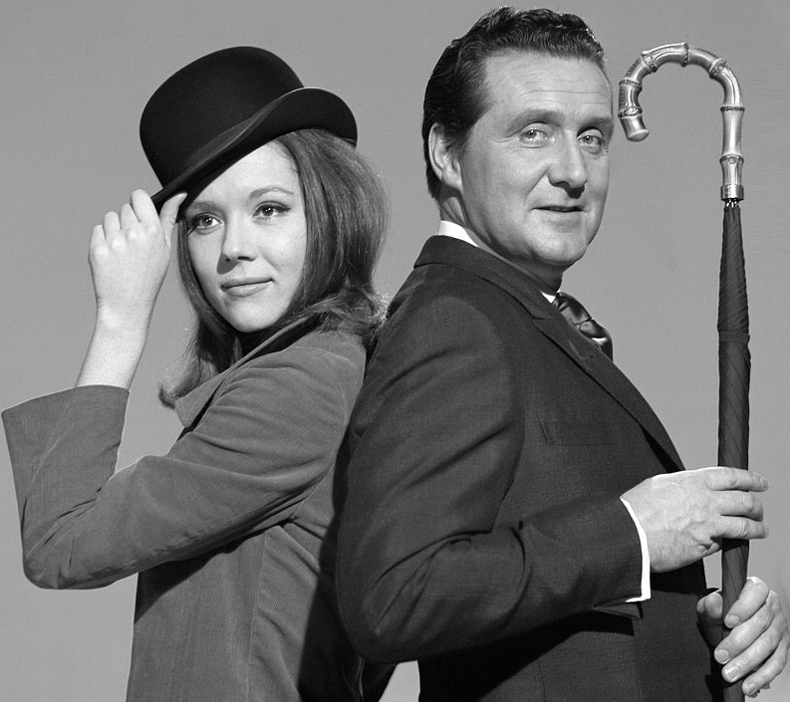 The pairing of Patrick Macnee and Diana Rigg remain one of the great on screen partnerships of cult British television and this represents an incredibly rare and fine example of principal character wardrobe from this highly regarded series.